Sorry haven't had time to make pictures. Final score is 16 999 pts. Wow, on laptop ? With a 1060 ? I put almost everything on ultra and don't get 80-90. It's more of 70-75 fps. You don’t want to run UE4 engine games on Ultra. There is guides on how to get best FPS in sandstorm, check utube. I’ve had a mix of high textures/low shadows, no SS, etc... Nvidia experience got good profile for it already. You should be able to pull of 144 FPS easily to match that refresh. Looking at one of those myself. If I’ll find one at the right price - will sure buy it. Your review with pros/cons would be greatly appreciated. There is no Optimus onboard. In case you live in the US and near a Microcenter, they are selling the 15" for $1700 and 17" for $1800. I live about an hour away but it was worth the drive to buy one (got the 15 myself). Pretty impressed by the build quality, especially the keyboard is surprisingly nice compared to others I've used and the speakers are awesome. Thanks for the heads up! What’s with the price? What’s the catch? MC exclusive SKU’s? Ah ok thank you mate. I'm feeling better now. Thought you were running the game with everything on ultra. I have some IC Diamond 24 at home. Last time I used it, the paste became so hard to remove I don't want to use it anymore. I'll go check for some liquid cooling. Is there any risk the liquid could interact with the mobo or other components ? For thermal paste remover, I used this https://smile.amazon.com/ArctiClean...9501658&sr=8-4&keywords=thermal+paste+remover or isopropyl alcohol. Yes, a bad LM application will short out components on your mobo. 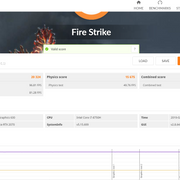 Do you have any games that have built in benchmarks you can use to provide us data?